How is it possible that Apple still can’t manage to ship out new AirPods orders in under a week, but Amazon has gotten at least three new shipments over the past three weeks? 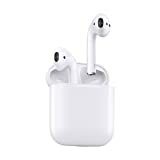 Whatever the case, Amazon is the place to go if you want to have a shiny new Apple MMEF2AM/A AirPods Wireless Bluetooth Headset in your hands within the next two days. AirPods are in stock right now at their regular retail price of $159, but they won’t be for much longer now that we’ve let the cat out of the bag. Go, go, go!